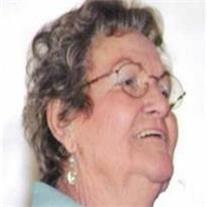 Cleo Gadberry “Kee”, 75, of Chandler AZ, passed away on December 9, 2009. Born in Thatcher AZ, to Allen and Madge Germaine, number eight of nine children, she spent her early school years going to Tucson Amphitheater and graduated from Gilbert High School in 1952. Cleo loved sports and was the catcher for the Gilbert High softball team. She was asked to play badminton for the school; never playing before, she came in second at the state finals. She also had the opportunity to catch for the famed Dottie Wilkinson. Cleo loved the outdoors, going camping and fishing in the White Mountains and doing mining claims in the Kofa range with her husband Bill. She will certainly be missed by family and friends. She is survived by her siblings Harold, Laura, Chad and Kent and four sons, Bill, Ron, John and Mark. Visitation will be Friday December 18th at 10:00 am, followed by a church service at 11:00 am at the Ray 3rd Ward, 1115 E. Ray Road. She will be buried at the National Memorial Cemetery, AZ. Arrangements by Bunker’s Garden Chapel.